Answers to questions under the Access to Public Information Act (APIA), received from the Ministry of Foreign Affairs and the Ministry of Environment and Waters, confirm information by Bivol, published on June 18 that the Minister of Environment and Waters Neno Dimov has had a luncheon with Ambassadors to UNESCO at the headquarters of the Organization in Paris. The meal, whose ultimate goal is lobbying in favor of the oligarch Tseko Minev, has been paid with money earmarked for Bulgaria’s European Presidency. A total of 25 people have attended the luncheon, organized by Bulgaria’s UNESCO Representation (see the list at the end of the publication). Of these, 16 are ambassadors, and the other two are advisors. Several of them are representatives of countries that sit on the World Heritage Conservation Committee that was responsible for adopting an expert report of the Organization, calling on the Bulgarian government to cancel its decision giving a green light to new construction of ski slopes and lifts on 48% of the territory of the Pirin mountain. This decision, quite obviously, serves the interests of the oligarch Tseko Minev, owner (according to Prime Minister Boyko Borisov) of “Yulen” JSC, the concessionaire of the ski zone in Pirin. EUR 1,612.50 from the budget have been paid for this maneuver while the luncheon is being presented as one of the events marking the end of Bulgaria’s Presidency of the Council of the European Union. During the so-called working lunch, Neno Dimov has tried to convince the attendees that the government’s decision is a good one and the expert report should be mitigated. A week later, at a meeting of the Organization in Bahrain, the report was indeed adjusted, but not to the extent that the government had been seeking. In an interview with Tsvetanka Rizova, host of the political talk show “Face to Face” on bTV, Neno Dimov stated that he had not organized the feast and that this was “fake news”. Host: I read in Bivol that you had some mysterious meeting, you have even invited to lunch dozens of UNESCO ambassadors at the headquarters of the organization in Paris and you have lobbied against a draft decision of the UNESCO World Heritage Committee associated with the Pirin National Park. Was there such a mysterious encounter? Neno Dimov: Yesterday, I had a working meeting in UNESCO and I did meet…, I do not see anything mysterious by the way; I had meetings in Brussels in the past week, prior to that I had other meetings; this week there are also upcoming meetings in Hungary, Austria, then in Luxembourg. So, part of my job is to hold meetings and specifically to the question you are asking me – yes, I held talks about the upcoming Bahrain meeting of UNESCO, with the Committee that will meet in Bahrain, where the Bulgarian State will be also represented, so I had a working meeting, but I have not invited anyone to lunch, actually, that is probably some sort of fake news, isn’t this how we call them now? In perfect synch, after this interview, the propaganda media of controversial lawmaker, businessman and media mogul Delyan Peevski and newspapers and websites sponsored by First Investment Bank (FIB) in which Tseko Minev is a majority shareholder, resumed their dirty smear campaign against Bivol, accusing our site of distributing “fake news” about the Paris event. Documents that can be seen here, here and here, however, confirm everything that we have written. As the highest-ranking representative of the Bulgarian State at an officially organized event – working lunch, Neno Dimov is by protocol its host and it is quite correct to say that he has “invited ambassadors to a luncheon/organized/hosted a luncheon for ambassadors”. This metonymy is often used in Bulgarian in such a context when it comes to governmental and diplomatic events. Unfortunately, the talk show host, Tsvetanka Rizova, who helpfully explained during the interview that it was all about “disinformation,” did not respond to our attempt to get in touch with her and defend our position. We are now waiting to see if Nova TV will react to the facts proving that Neno Dimov has used the most popular nationwide TV stations to lie on air. Look, Ambassadors! And Neno is here as well! The answers by the Ministry of Foreign Affairs and the Ministry of Environment and Waters cannot conceal the public fact that this luncheon has happened. But in order to divert attention from the impression that Minister Dimov has lied on live TV, the Ministry of Foreign Affairs has engaged in explanations bordering the tragicomic. According to them, the visit of Neno Dimov to UNESCO and the working lunch with the ambassadors were two parallel events organized by the Bulgarian Embassy in Paris. The luncheon had been in honor of the end of the European Presidency, and Minister Dimov had been invited to attend it as a representative of the Bulgarian State, who “coincidently” happened to be in Paris on that same day. This ridiculous explanation has been firmly refuted by diplomatic sources of Bivol, according to whom the event has been organized and presented to the foreign ambassadors namely as a meeting with Minister Neno Dimov, in which he was to present the arguments in favor of the governmental decision for Pirin and to plead for altering the expert report that is calling for cancelling it. 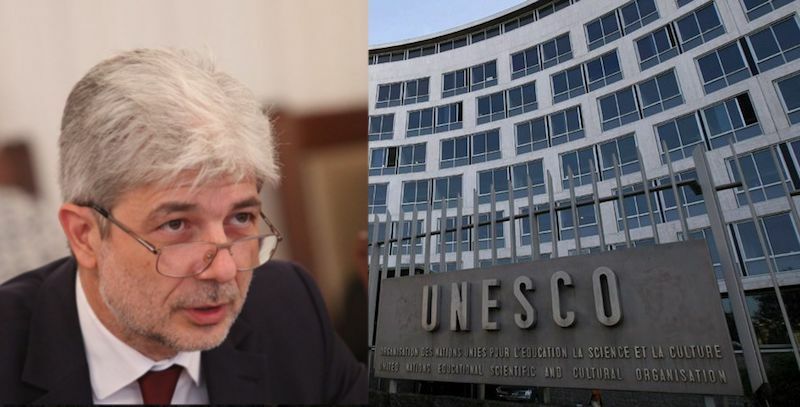 In addition to this luncheon with the ambassadors, Neno Dimov has held two meetings with UNESCO officials and they have formally justified his trip to Paris of which even his own press office was unaware. The fact that this carefully planned lobbying maneuver in favor of the oligarch Tseko Minev, the concessionaire of the Bansko ski area, has been paid with money from the budget for the European Presidency is particularly scandalous. As it is not possible for a minister to meet all ambassadors within one or two days, the working lunch is a technical solution that is often used in such “urgent” cases. That the case is urgent and important for the government was made clear by the solid delegation sent to Bahrain and headed personally by Deputy Prime Minister Valeri Simeonov, who is the most prominent lobbyist for Tseko Minev’s interests.